Description of La Chimera. 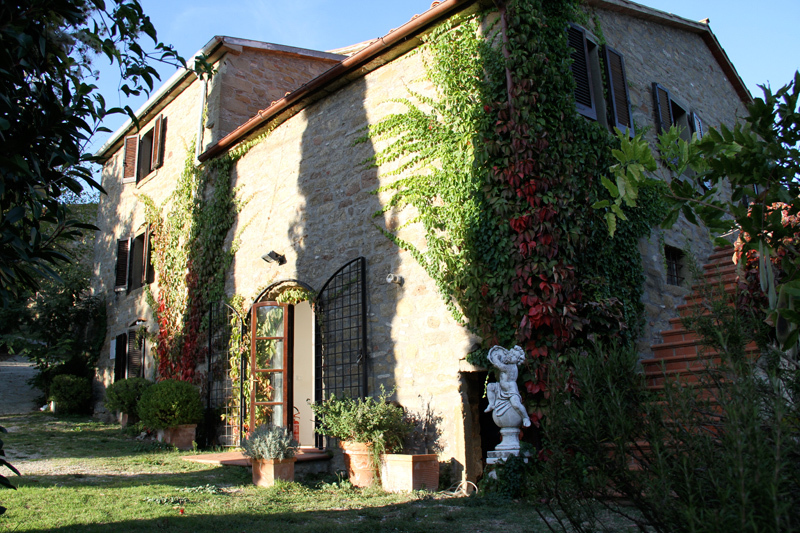 Luxury villa holiday rental near Cortona in Tuscany. Yoga retreats or private holidays. The Large Dining Terrace enjoys the unbroken view of the entire valley. 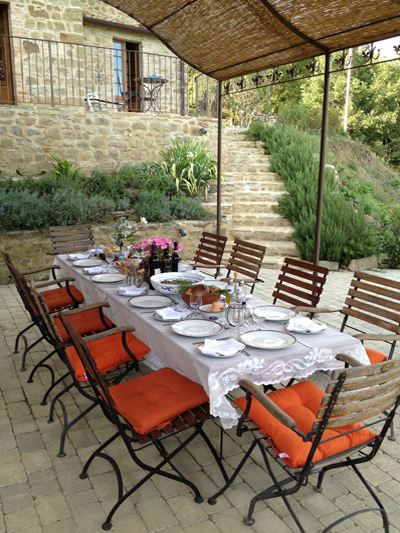 The wrought iron Pergola gives a romantic feel to any dinner and the table and chairs seat up to 25 people. The Chill Terrace is next to the Dining Terrace, and has comfortable sofas, table and another seating area. This is the perfect home to moonlight conversations, a glass of wine and the chance to sit back and relax with an aperitivo and glass of wine. The Upper Terrace is off the TV room, and is a private little drinks or breakfast area with a gorgeous view. There is sunbathing around the pool, or down on the Lower Terrace. The wooden yoga deck is great for meditation, exercise, or just having a frolic. The dining room can seat 8 and the terrace dining area can seat up to 20. There is also a large lounge area and a comfortable movie room. The house sleeps up to 12 people with further room for two in the rustic Cabina below the pool. The Barn next door on the next property can be rented separately in advance, giving space for 8-10 more people. All the double bedrooms are large, light and beautifully decorated with spectacular views of the valley, wooden shutters, and a mixture of double and twin beds. Four have en-suite bathrooms, the others have easy access to large bath and shower rooms located within the house. The meditation room also serves as a small single, as does the top room, which can also be used as a living area when not curtained off as a bedroom. La Chimera’s many levels and terraces make for a unique and memorable stay - some of its most beautiful features are its ivy strewn, covered lounging terrace, peaceful stone surrounded pool terrace, upper living room, which features a huge ancient stone fireplace and vaulted ceilings, and forest-surrounded yoga deck. In the summer the outside of the house creates a feeling of open-roofed rooms, separated by rosemary lined stone stairs and paths. The 670 metre elevation means that however hot the weather, the house and its grounds do not become humid and usually benefit from summer breezes.